rison of the three different stages of that period. in a study period from July to December, 2010.
that period more than other stu died years. highest in developing countries . mortality rate that is twice the normal rate . premature babies compared to European countries . other factor for the increase of the IMRs [15-17]. second stage 2003-2007, and the th ird stage 2008-2010). Al-Anbar gover norate, Western Iraq. 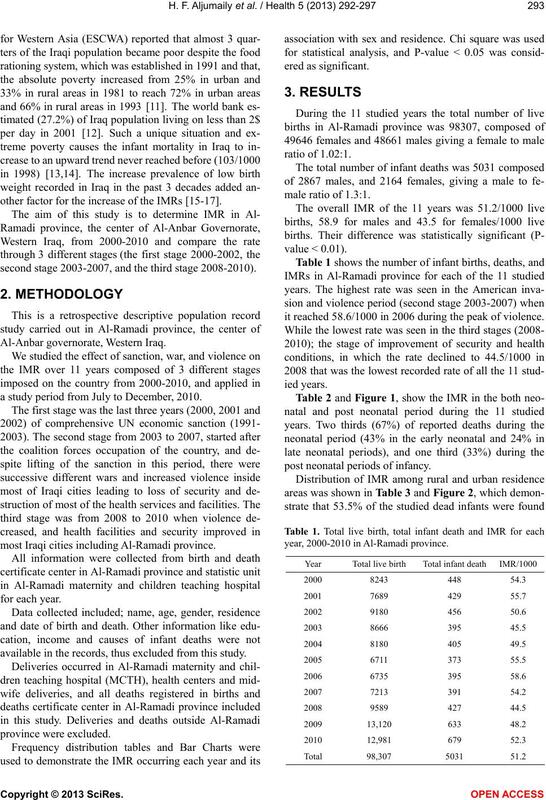 a study period from July to December, 2010.
most Iraqi cities including Al-Ramadi province. available in the record s, thus excluded from this study. it reached 58.6/1000 in 2006 during the peak of violence. post neonatal periods of infancy. year, 2000-2010 in Al-Ramadi province. Table 3. The effect of residence for all years 2000-2010. (PND) for each year 2000 to 2010. (urban deaths UD, rural deaths RD), for each year 2000-2010.
effect of comprehensive UN Sanction. needs of the Iraqi people. Coalition Forces Militaries [21 ]. factors for the increasing of the IMR. by post neonatal environment and security conditions. Figure 3. The IMR of Al-Ramadi province and the IMR of Iraq. crease of IMR at that period. fection and access to health care facilities . Journal of Sociology and Anthropology, 3, 15-21. Bernadine Healy, M.D. (2012) Behind the baby count. gency, Disaster and Refugee Studies. Ministry of Health (1990) National child survey 1989. (per 1000 live births) in Iraq. Federation of American Scientist (2011) Child mortality. Iraq morality estima t e.
after Gulf War. Poverty reduction series-4. The World Bank (2011) World development report 2001. Mediterranean Health Journal, 7, 956-965.
tion of Iraq. Archives of Disease in Children, 88, 92.
in Iraq. Jou rnal of Tropical Pediatrics, 52, 147-150. 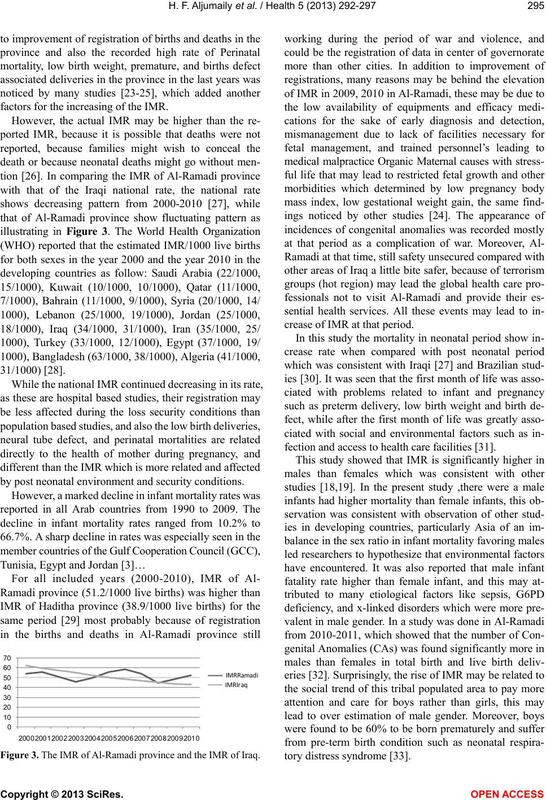 Effect of the gulf war on infant and child mortality in Iraq. The New England Journal of Medicine, 327, 931-936. Media coverage of thread posed by Iraq. 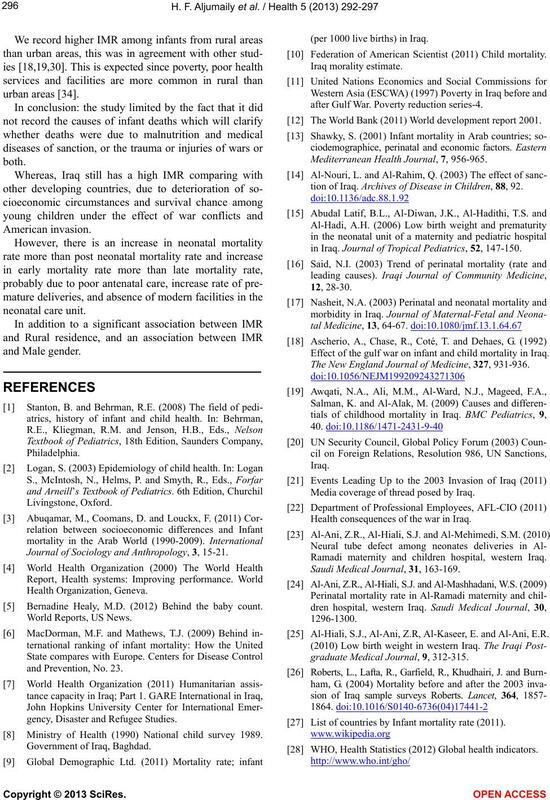 Health consequences of the war in Iraq. Ramadi maternity and children hospital, western Iraq. 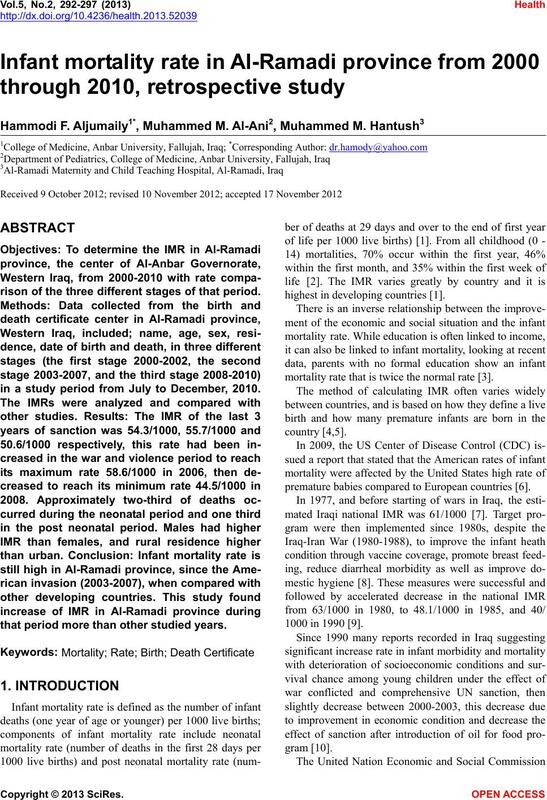 Saudi Medical Journal, 31, 163-169. Al-Hiali, S.J., Al-Ani, Z.R, Al-Kaseer, E. and Al-Ani, E.R. graduate Medical Journal, 9, 312-315. List of countries by Infant mortality rate (2011). WHO, Health Statistics (2012) Global health indicators. Goldani, M.Z., Barbieri, M.A., Bettiol, H., Barbieri, M.R. 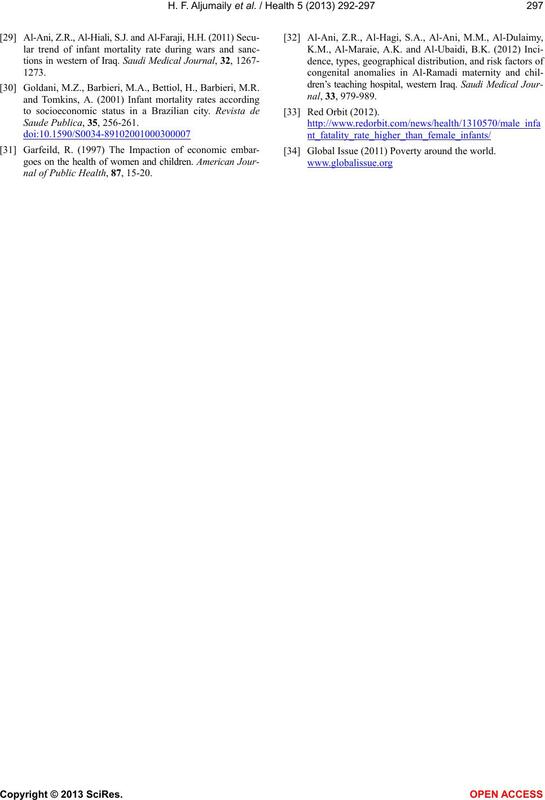 nal of Public Health, 87, 15-20. Global Issue (2011) Poverty around the world.